Be in the know wherever you go. Don't use regional evapotranspiration or rainfall information. Easily get soil moisture measurements and irrigation recommendations tailored for your location, your field, soil and crop type. Observe if water content declines and at what percentage plants begin to stress. Recognize when soil has too much water. Using this information, it is easy to identify optimal volumetric water content range and know that anything below or above that range will be too little or too much water. How does REFARMO Soil Moisture Analytics work? Firstly, field data from ground sensors and space satellites which acquire field level hyperspectral and microwave data. For example, corn field, sugarcane field, golf course data are collected and processed in REFARMO cloud platform. 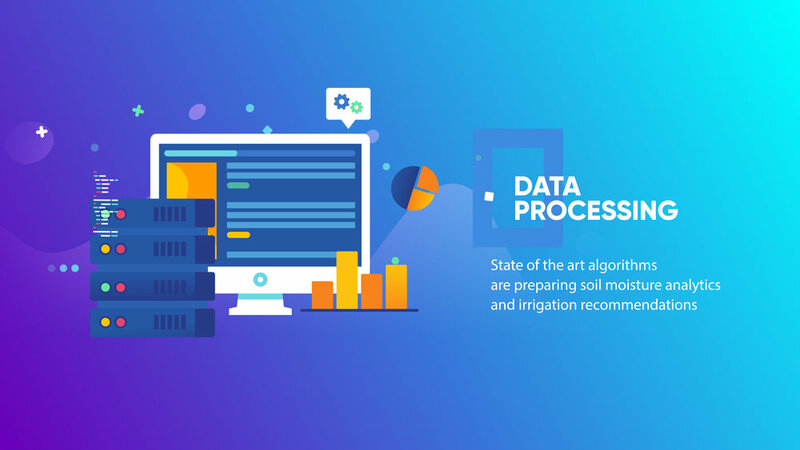 Secondly, REFARMO cloud platform interprets the data and sends back actionable information to the user for decision-making on various aspects of irrigation management. State of the art algorithms are minimizing soil salinity and textural effects, making soil moisture analytics accurate in most soils and vegetation types. Agriculture companies, farmers and golf courses can use REFARMO web portal to access soil moisture data, rapidly determine when and how much to irrigate and efficiently organize work around next irrigation event. This should prevent nutrients leaching, save time, reduce plant stress and increase production. REFARMO offers soil moisture analytics and irrigation recommendations - everything to reduce plant stress, water consumption and increase food production. Do I need to buy any other equipment or services? No. REFARMO is a web-based solution. If needed REFARMO team will install sensors on your field to test soil moisture measurements accuracy. How can I buy REFARMO Soil Moisture Analytics? Request a contract by feeling in the form.